With the onset of the New Year we decided to up date our Baseball game statistics. 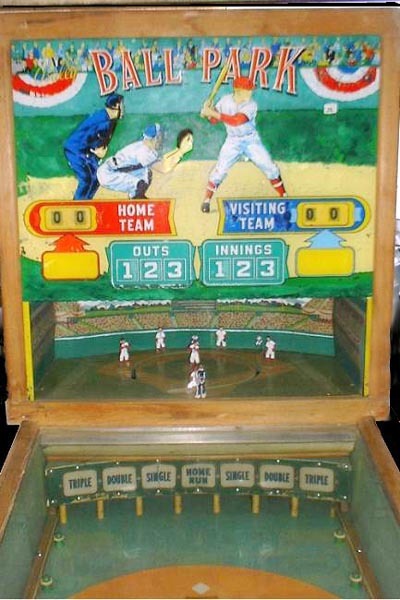 Our updated Baseball game list now has 192 machines with a Baseball theme. 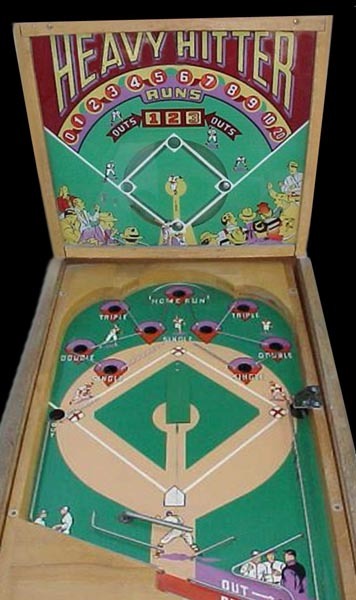 This list includes Pitch and Bat games as well as Pinball games with a baseball theme. Roll Downs and Shuffle Games with a baseball theme are also included in this data. These machines were manufactured by 24 different Manufactures. This list contains an increase of nearly fifty games and an additional 4 manufactures than it contained in February of 2003. The table below is the same format as that used in the previous chart but now includes any game that has a Baseball theme. We are still in the process of checking the accuracy of these data entries and are continuing to find additional Baseball theme games to add to this group. We are checking all our resources but still have some games with very few references and need to locate additional images of these games verify the accuracy of our data. We have solved many mysteries but still have much to do. THE GAME WITH MANY NAMES! The above is the most often misused title. The confusion began from the very first announcement of the machine’s availability in a Billboard Magazine article in the May 7, 1955 issue on page 86. The title of the New Game Announcement article uses all capital letters to announce "Chi Coin Ships New Big League Baseball Game". Is Baseball part of the title or simply an adjective used to describe the type of game? 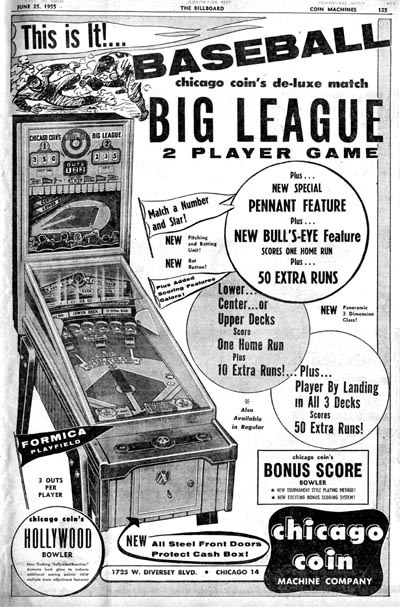 As can be seen in the first line of the article, Billboard then states: "Bulls Eye Big League Baseball, a new baseball novelty game , was shipped to distributors this week by Chicago Coin Machine Company." So which was the correct name, the one used in the Title or the one used in the body of the article? We settled on the title Big League since this is the name used in an advertisement placed by Chicago Coin, the company that made the game. This is a true primary source not a second hand article written by a Billboard reporter who usually reported new game names accurately, but, unfortunately became confused by the backglass just as many have including ourselves. In this ad the term Baseball is used to identify the type of game it was, as opposed to a pinball or arcade game. In this ad the term Bull’s Eye is clearly used to identify a feature and is clearly not part of the name of the game. To further confuse interested parties, that would be us (collectors, historians and other truth seekers), Chicago Coin released another Big League in April of 1965. 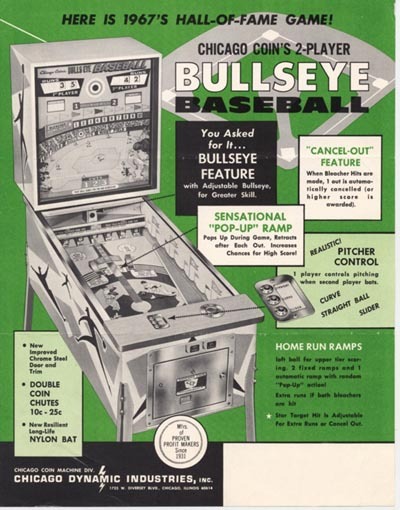 And worse yet they released another game in 1967 entitled Bulls Eye Baseball. This was a two player pitch and bat game as can clearly be seen in the flyer. The latter was also released as a Deluxe model. When first compiling lists of games, original source material was not available. So it became necessary to reley on the name that appears on the backglass or in an article. Often, in the early days of trying to compile complete lists, a date of manufacture was not readily available. For these reasons the above mentioned machines just added to the confusion! Our next up date will involve our decision about how we plan to eliminate some of the name confusion by adapting a naming convention for baseball theme games. Upon reviewing our data on Pitch and Bat games (N-PB) we realized that several of the games that carried this note were not truly "Pitch and Bat" games. After reviewing the variety of games we have decided to modify our notes to better describe the various types and variety of games that are based on the theme of Baseball. The first change we agreed on was the addition of a Note - TB. Because of the great number and variety of games that have a Baseball theme we felt that it was important to identify all of these games in one category. Hence the Theme Baseball Note. We are currently reviewing our entire database to determine which games will carry this new note. We also intend review all the games in our Note - PB to make certain that only games that somehow launch the ball at a bat type device are included. We are also implementing a note that identifies games that have a mechanical base running unit. These games have a manikin type of base running unit. 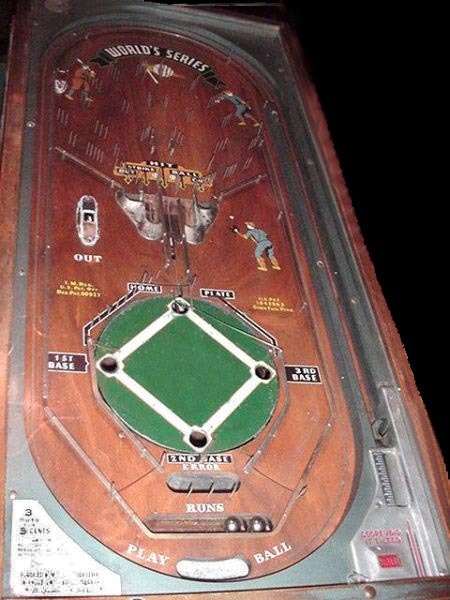 We felt that our current notes that identify light animation and mechanical action on the playfield and backglass were sufficient to identify Baseball base running action using lights or the shifting of the balls on the playfield to simulate runners. But the special unit that actually animates manikins that mimic the type of movement of runners based on the type of hit (double, triple) were such a special mechanism that these special machines should have their own note. In our first explanation and summary we mentioned that we were removing a game listed as "Lite A League". This entry was gleaned from a 1955 Mike Monves catalogue. This name appeared twice next to an image of a baseball machine on page 15. 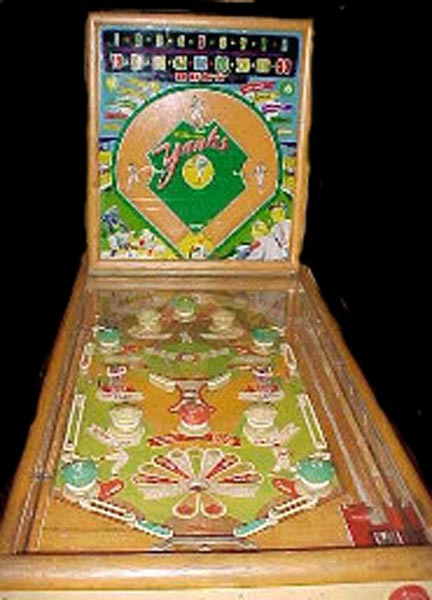 The name also appeared in a list of games identified as baseball type machines on Page 23. When we were first compiling our list of games we felt that this was a good source of data for including this game in our list of machines. During our recent more in depth search of Baseball theme machines we uncovered a primary source (Billboard Magazine February 2, 1946 pg 110) for a game entitled "Lite League". Upon comparing this to the picture in the Monves catalogue it was determined that the correct name misprinted in the Monves catalogue was "Lite League" and therefore removed Lite A League from our data. More intrigue in our next up-date. Based on our data as it exists in February, 2003, we show 145 machines that have been designed as Pitch and Bat games. These games were manufactured by 20 different companies with one game showing an unknown manufacture. 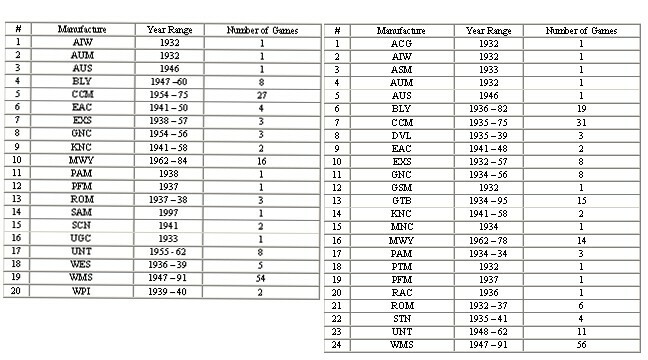 The table below shows a list of these manufactures, the range of years they produced Pitch and Bat games and the number of games made during those years. We realize that there are many incorrect entries in this data. We plan to up date this data on this site bi-monthly and post any changes we make as a result of our research. One such change is the removal of a game in our data listed as "Lite A League." This game was an unknown MFG and unknown Date. More on this change and how it came about in our next update. 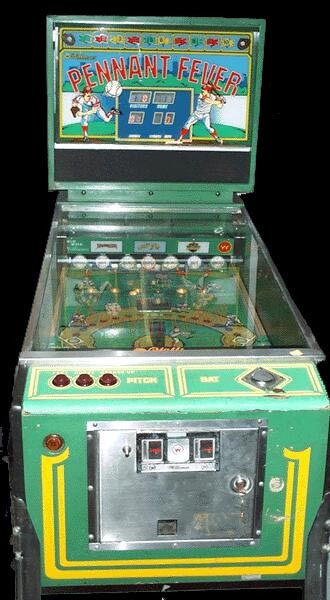 When we first began to gather information about pinball machines we decided to include games that were not strictly pinball machines, but used similar cabinets, internal electrical components, and back glasses. These machines were labeled Pitch and Bat, and were assigned a special note: N-PB. We are discovering that pinball games that use a baseball theme are occasionally included in this note. The data that we are about to describe is based on our listing of N-PB. 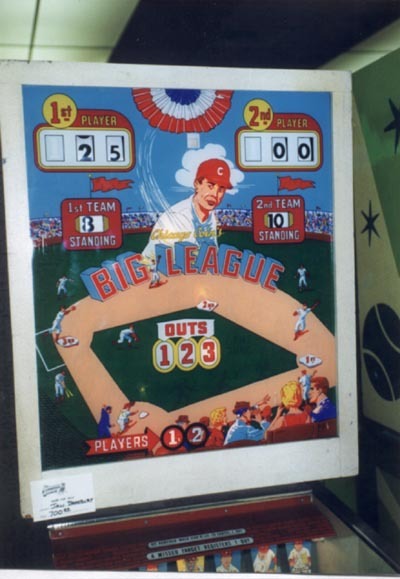 We are currently making decisions about how to include pinball machines that use a baseball theme but are not true pitch and bat games and how they should be listed. Because our N-PB does not include all Baseball theme games, but does include some, our current statistics regarding these games is not completely accurate. We are currently conducting research to correct this problem. Your online resource for baseball!